I think it is safe to assume that getting people into the pews is a conversion goal most, if not all church websites share. But how are guests going to eat all the donuts and sleep through the sermons if they canâ€™t figure out how to get there? One sure way to kill off the â€˜it was hard to findâ€™ excuse is embedding Google Maps on the directions page of your church website. Especially now as Google claims to have made embedding as easy a 1-2-3; though I personally think it takes about 10 real-world steps. Goto maps.google.com (phew, that was easy!-). Login to a gmail account. Yeah, note that even though youâ€™ve added Google aps to your churchâ€™s domain, youâ€™ll still need a gmail account. Hopefully one that reflects the name of your church will get it done. Note to Google, how about adding maps to the aps? Please? Now, enter in the address of your church and charity. An alternative is to enter the latitude and/or longitude (uber-geeks please take notem, that would be â€˜38Â°53â€²55.55â€³N 77Â° 2â€²11.96â€³Wâ€™ in the case of my example). Click on the â€œSave to My Mapsâ€ and either save to and/or create a new maps page for your organization. Modify the description of your marker, taking advantage of the fact that you can enter hyperlinks – like to the rest of your church web site. Click on the â€œLink to this pageâ€ link. Copy the stuff in the second form text field entitled â€œPaste HTML to embed in websiteâ€ â€¦ donâ€™t be afraid to resize the map by clicking on the â€˜Customize and preview embedded mapâ€™ link – especially to make the map tall than wide to better accommodate your ‘step 5’ annotations. Encapsulate the code in a division of your choosing for later CSS control, then either save it to an individual file that youâ€™ll include in other pages, and/or paste it into your directions page – NOT YOUR CHURCHâ€™s FRONT PAGE. Also, WordPress users, I might suggest using a plug-in as the editor breaks badly when embedding such iframes – unless you disable the visual editor via your user profile. Test the map from as many different browsers as possible. Collect metrics to see how effective this all is. Thatâ€™s it. And heading my advice in step 8 – you can see an example of it on my website over on a separate ‘direction example‘ page I created for this mad experiment. Your mileage will obviously vary, so leave a comment and lemme know how it goes. Google Map API: Don’t feel like coding? Embed a map! Thanks the for the info. useful stuff. 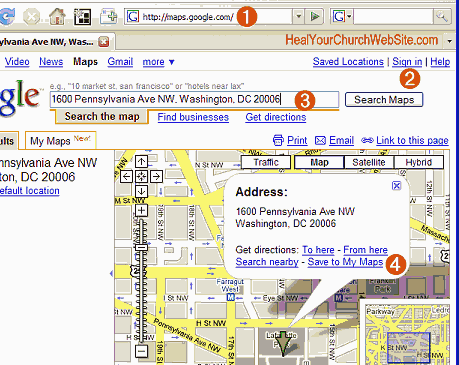 You can also add a listing for your church in the Google Maps Local Business Center. That lets you add all sorts of info to the listing that’ll come up on searches, including hours, url, & much more – even some photos. Click the map pin for details and see the ‘more info’ for even more. neat stuff. I noticed that on your example page, using IE6, that click the link to HYCW inside the map opens the HYCW web page inside the map box. It doesn’t do that on the actual Google maps page (accessed by clicking ‘make this map larger’). Is that the way it’s suppsoed to work? I went a different route with our website. Rather than provide a map right off the bat we have the user type in their address and when google maps opens it already has the driving directions from their address to our church listed. Notice our area is also part of the google transit. Similar code used there as well for our bus stop finder. I Googled “embed map with directions” and found this how-to. Thank you so much for posting this. I knew this could be done but did not know how to do it without spending hours trying to figure it out. Thanks again!